This man is a bbq genius. I have watched him for a long time on his cooking show. Now I am glad to have his book where I can use it for reference and look at it time and time again. I bought this book for myself. It was so wonderful, I got four more copies to give out as gifts to friends. There is everything in here from barbecuing a whole pig and spit roasting an entire lamb to making hot dogs and hamburgers. Included are recipes for turkey pastrami, smoked salmon as well as four ways to roast a whole chicken. Steven Raichlen is a grill master extraordinaire. His book has directions that are easy to follow. Everything looks delicious and you will be using this all summer long. Outstanding!! Without a doubt the best cook book on the market for avid BBQ cooks. The recipies are easy to follow and very specific on how to mix the ingredients. My favorite sections are the marinades. Fish,chicken or beef,they all bring out flavors I've never experienced. I thought I knew a lot about backyard grilling,and with this book,now I do. Do your self a favor-buy it. No,buy several as I did,keep one and give the others to friends or neighbors. You'll be glad you did! The OTHER best BBQ book. 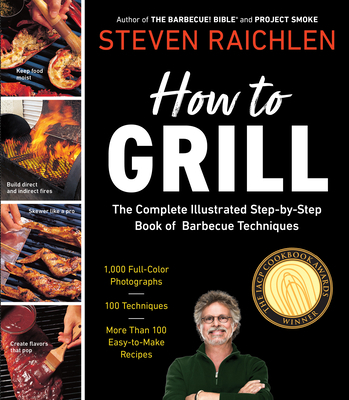 Steven Raichlen's "How to Grill" & "Barbecue Bible: Sauces, Rubs and Marinades, Bastes, Butters & Glazes" are like the Old & New Testaments, well sort of. If you had to just have 2 cook books on griling, you could not go wrong buying these two.